Beach wedding requires you to wear attire that suits the nature of the theme. Check out some ideas to be kept in mind before picking up a casual beach wedding dress. 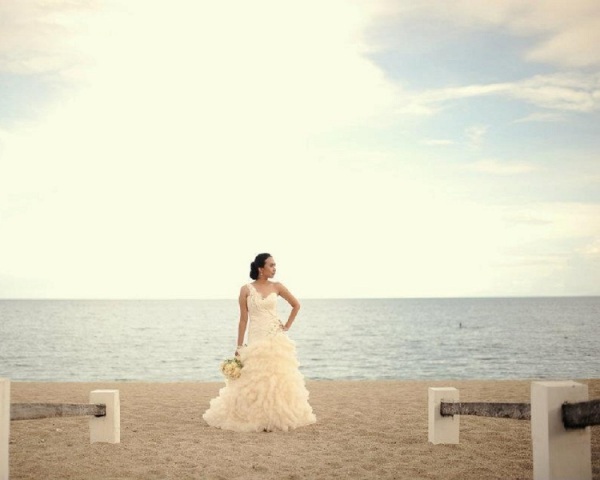 Beaches are becoming increasingly popular locations to tie the nuptial knot. With Mother Nature at her very best, in the backdrop, the wedding gains an added ounce of splendor and magnificence. Apart from providing a romantic feel to the wedding, the calmness and tranquility mystifies the whole ambience. While many women merely fantasize a beach wedding, there are some who actually take a step ahead and make their dream come true. The dress for a beach wedding would depend on a number of factors. Since the wedding is casual in its nature, the attire chosen should also be a casual one. Apart from that, it should also reflect the theme of 'beach'. Check out some ideas that will come handy, when you go for picking a casual dress for your beach wedding. The attire for a beach wedding is usually casual and has numerous options. You can choose to wear a strapless dress, a spaghetti strap dress, sarongs and top or even a pretty halter dress. The length of the dress can vary from short, flirty ones to long gowns. Tea length dresses, however, represent the most popular choice for a beach wedding. It is recommended not to indulge in materials such as silk and satins, as they do not stand well in humidity. Instead, resort to crepe, charmeuse, duchesse satin, damask, chiffon, batiste and illusion nets. These materials go well with the beach environment and ambience. Look for dress styles that complement your body type. Don't rule out fitted dresses, even if you have a less than perfect figure. Tailored dress will always look better than something too baggy or shapeless. Since it is a casual beach wedding, embellish your attire in a minimal way. Heavily sequined and embroidered dressed look gaudy and do not gel with the theme of the party, unless you intentionally want to look out of place. While white is one of the best color choices for wedding attire, soft pastel colors also look exquisite. Cool blue, grassy green and lemon yellow would make great picks. It is advisable to select the right kind of headwear. Since veils may not be sustainable on the beach, due to the strong winds, the best would be to opt for a pretty straw hat or a simple scarf. This will prevent your hair from blowing and also add to the casual look. In case of footwear, go for simple strappy flats or flip-flops. The last thing you would want to get a costly pair of satin pumps, only to see them get distorted in the sand. Some even prefer to go bare footed, to get a proper feel of the beach. Coming to accessories, nothing can beat the beauty of flowers on a beach. So, whether it is the barrette or hair band, get one that has real or artificial flowers. A last piece of advice, just be cool and enjoy every moment.